Legacy of Daddy tour stop. What happens when a Graduate student competes for a PhD in a dystopian society by experimenting with dangerous alien technology? Does humankind need technological help to leave Earth? These and other questions are awkwardly dealt with in The Legacy of Daddy. Erin Rose is a twenty something who woke up in an apartment with no memory of how she got there, the belongings in the apartment, the clothes she has on or the face staring back at her out of the mirror. The only reason she knows her name is because her wallet with her Identification was on the dresser. That’s how the story begins and she restarts a life with no memory of her past in this world ruled by two camps of vampires. The Sanguans who still drink from humans, legally between four and five AM, and the Spectavi. I think Spectavi is supposed to be vampire for vegan though lines blur as the tale unfolds. I give this a five out of five star for world building and four stars for the protagonist who seems to wander through the story becoming a serial victim. Four stars because she develops later. The alternate belief systems adopted by the vampires is interesting as is the political twisting in which they engage. I recommend this series to vampire aficionados. Enjoy. 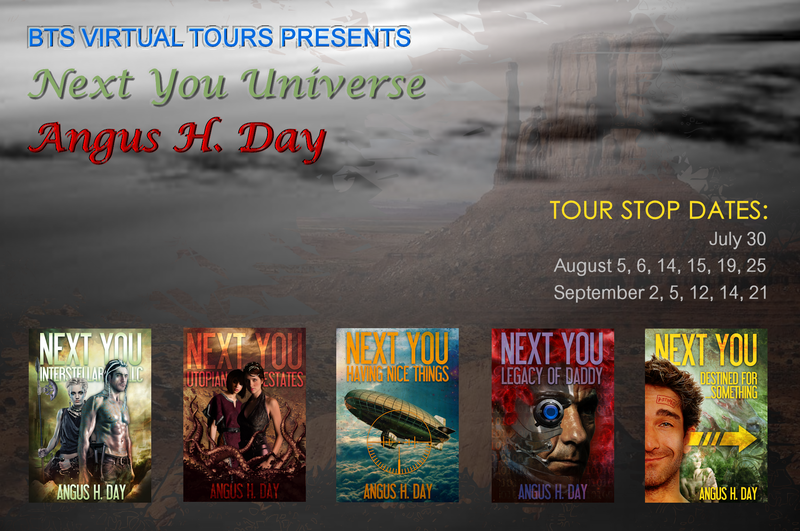 Blog Tour: Angus H. Day. Interview & Giveaway! Blog Tour: Angus H. Day. Interview & Giveaway!. Book Review: YA Paranormal Romance. Julia has traveled the flow of foster parents until her seventeenth year when a Nephilim Hunter named Samyaza attacks. He kills the family she has and she goes on the run with another Nephilim that she is falling in love with while she discovers what her birthmark and healing abilities can do for her life. Her affections for Cayne grow as they travel across the country fighting supernatural beings. This is a fairly quick read with samples of Ella James other works at the end of the book. The environment is definitely PG 13 and not a hot-bothering work. Some of the treatment of violence is graphic though nothing worse than what is permitted on television these days. I give it four stars for plot and quality. Elves have no freedom under the laws of the Realm which are enforced by Witch-Hunters and feudal land lords. An elf mage is lower than slave though if found visually appealing is sought after for carnal sport by human men. Dii’s world is oppressive and bleak until she finds safe haven and a place to grow in the Valley of Tremellic under the protection and tutelage of Archos the Archmage. Good people are loved and lost in this epic tale of a slaves struggle for freedom and the vengeance exacted upon her tormentors. The romantic love scenes are tastefully done and hot. I recommend it as an adult fantasy read somewhat risqué for those below the age of seventeen but if they are reading novels they have my blessing.